Representing professionalism and prestige, suits are the classic uniform of the working world. But when women wear matching trousers and blazers, it is immediately deemed a “pantsuit”—cue the cringing. 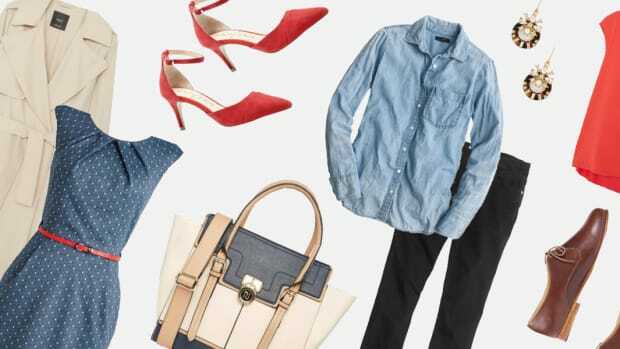 No doubt, it’s challenging for women to find office wear that is flattering to their femininity and also professional. Rather than just plucking another matching set off the rack, create your own suit by mixing and matching structured suiting pieces—ones that flatter your body and express your personal style. Breaking out of the matching mold means you’re more likely to get both pants and a blazer that look great on you. The result is a professional ensemble that is modern, less expensive, and much more creative. 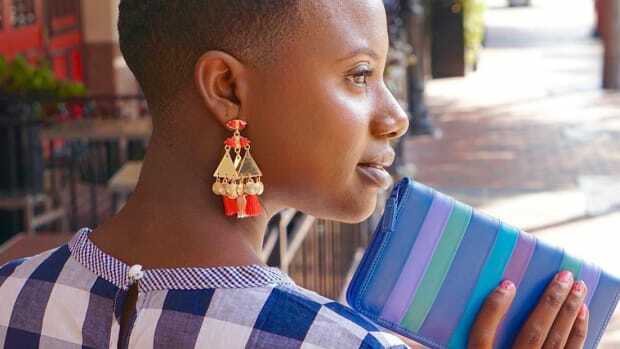 Take a look at the mixed-and-matched looks below; you might already have a few of these items in your closet. One piece of the puzzle is pant fit. When shopping for tailored trousers, choose a length that hits an inch or two above your ankle bones for a less boxy and more feminine look. When wearing wide-leg or palazzo pants, choose a length that skims the tops of your feet to elongate your legs. For a blazer, the goal is fitted. Stay away from blazers that have overly squared shoulders, loose boxy sleeves, and lengths that hit mid-thighs. 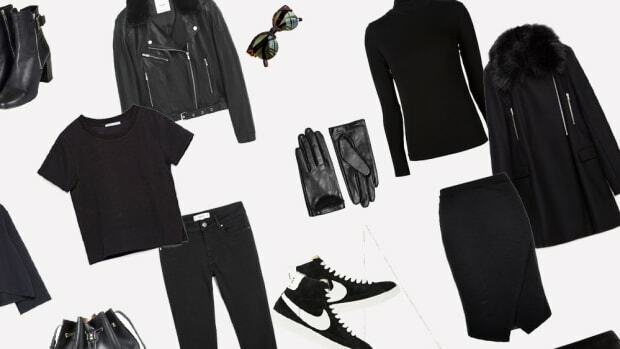 These menswear-inspired fits will look too eighties-style and will hide your feminine shape. 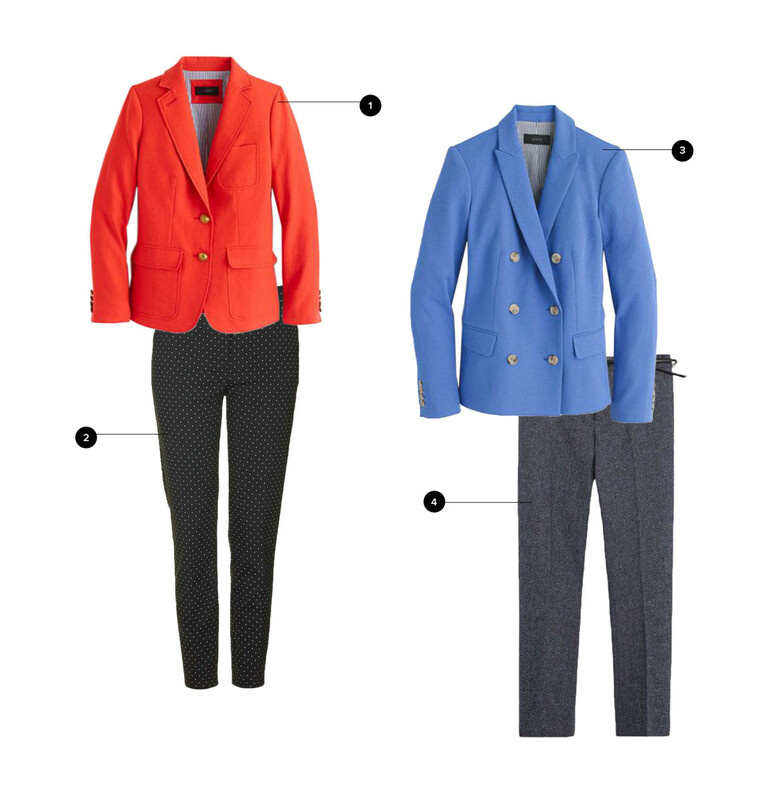 Choose a blazer that has tailoring around the waist, giving you an hourglass silhouette. The length of the jacket should hit slightly past your hip bones and should never cover your entire rear end. Last but not least, choose a sleeve that is tailored to the natural shape of your arm rather than boxy throughout like menswear blazers. Could a man get away with wearing a bright red blazer to his office? Probably not. Room for creativity is a perk of being a lady, so why not take advantage of it? When going bold with a brightly colored blazer, make sure you balance it with a neutral trouser in black, navy blue, or dark gray. If you’re feeling extra expressive, wear a trouser with a subtle polka-dot pattern. When going bold with color, think classic rather than trendy. 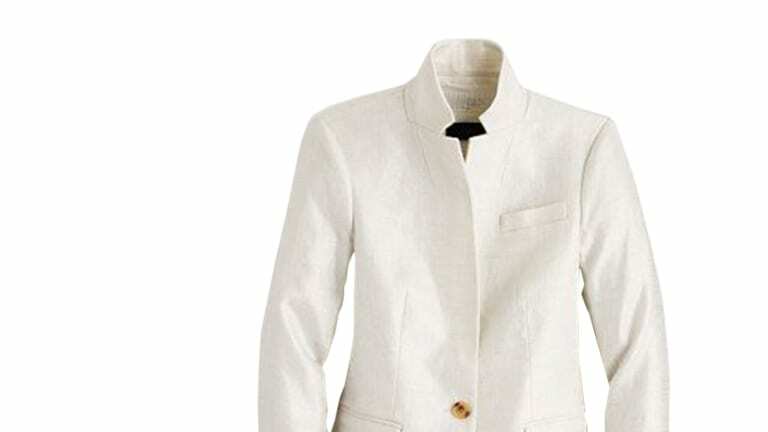 Stick to tailored blazers, and avoid boxy styles. Who says your blazer and trousers have to be the same fabric? Experiment by incorporating different textures, such as tweed and heathered linen. Different fabrics add dimension to your ensemble, even in conservative colors like cream and gray. This is also a great time to get inspired by Chanel’s famous tweed outfits. 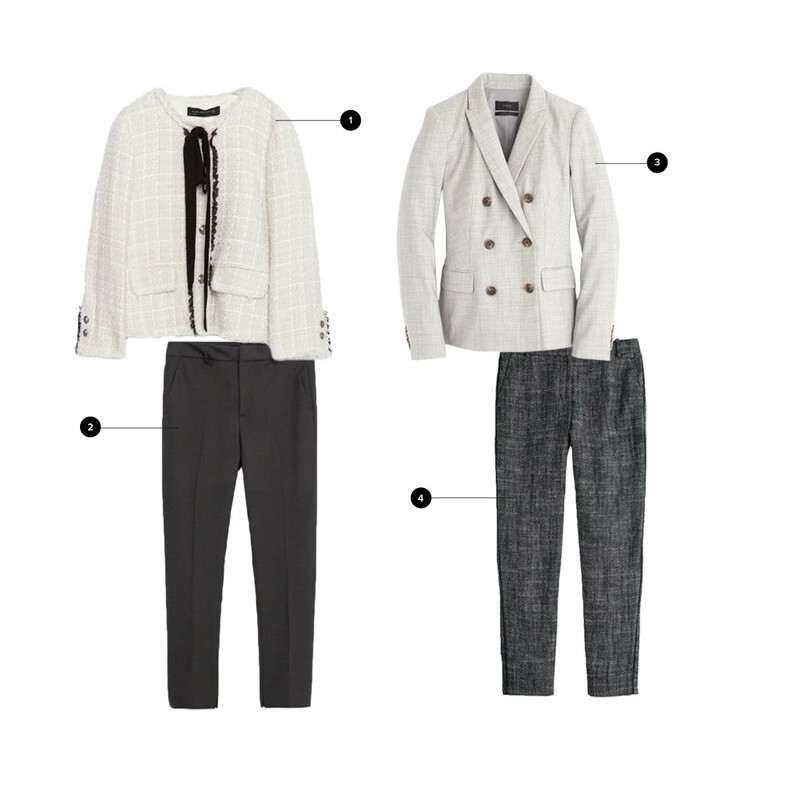 What could be more ladylike yet exude power than a Chanel-inspired suit? 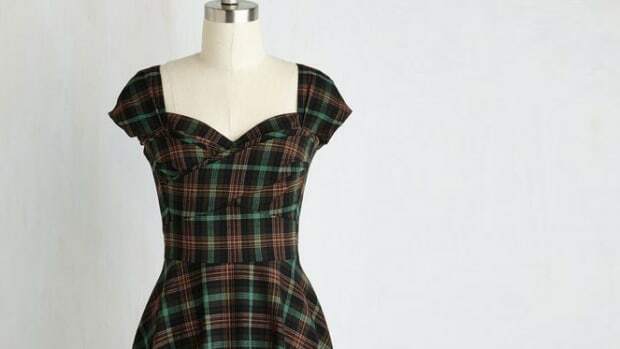 It’s time to get in touch with your English side and rock some traditional prints, such as houndstooth and plaid. See? Prints can be fun and professional. The key to this workwear ensemble is to not go print-crazy. 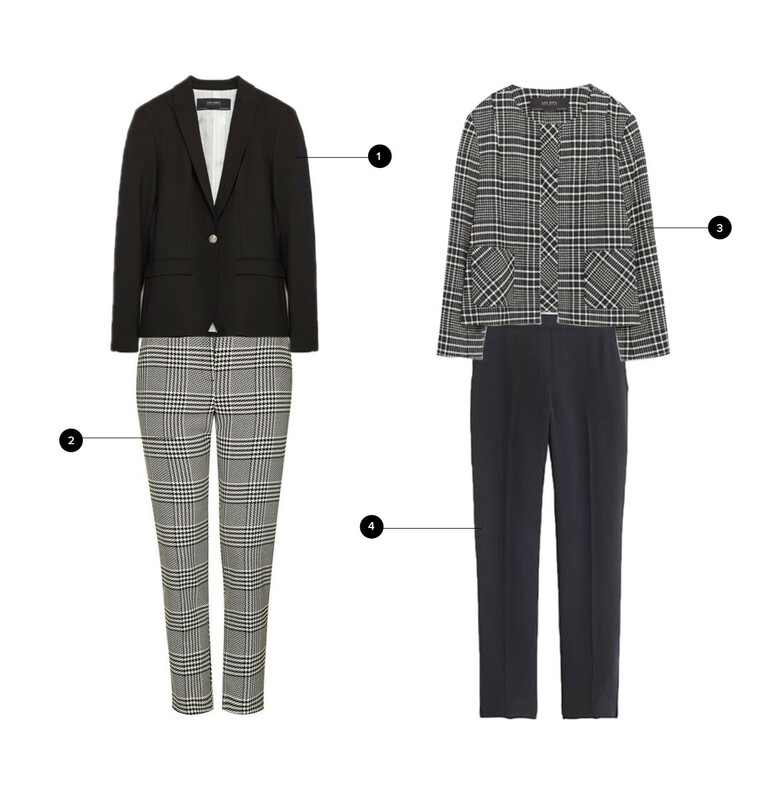 If you’re wearing a black-and-white houndstooth trouser, match it with a solid black blazer to tone down the print. We recommend matching your solid item with the darkest color in the print. Ideal for spring weather and warmer climates, pastel blazers and trousers are perfect for brightening up Monday morning blues. Channel Amal Clooney’s office style by opting for bright pastels and whites instead of traditional black and navy. When tailored well, even seersucker can be an office-appropriate fabric. 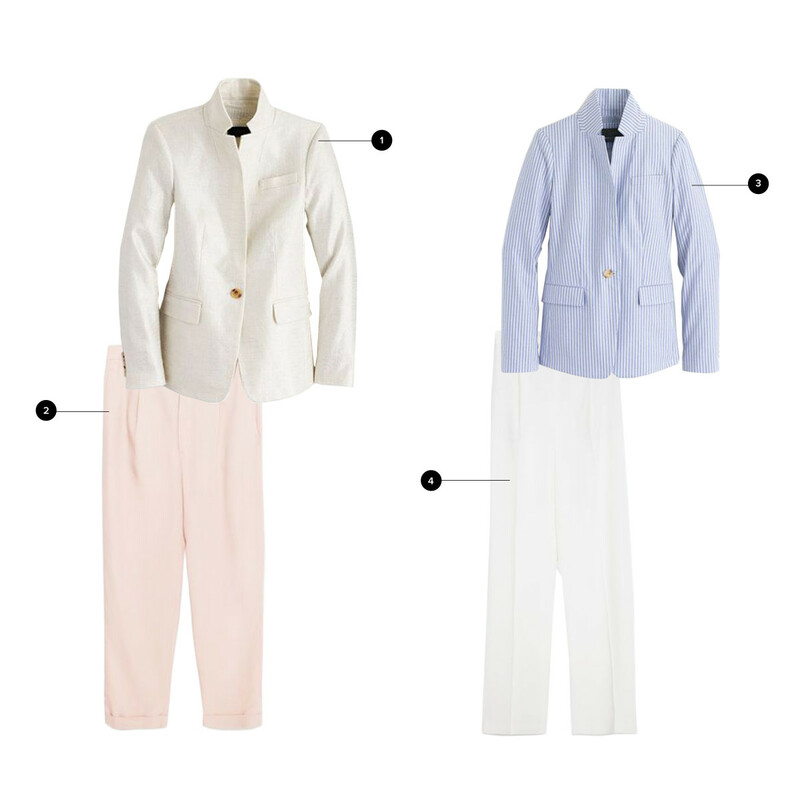 Wearing a pastel blazer and trouser at the same time looks a little dated, so complement your pastel piece with a crisp white item to keep the look modern and fresh.